I just wanted to let everyone know that after 18 years as a banker, I decided to change careers, and work where my passion is ...... CARS! I am a Sales & Leasing Consultant for Ballweg Chevrolet in Middleton, WI. Our family of dealerships also offers Buick, GMC, Ford, Toyota, Scion, & Mercedes-Benz. The dealership has been in business since 1965 and is family owned. Many of you may already know me as the Organizer of the G8 GXP Registry or the G8/GTO Owners iNternational Events. Our Chevrolet dealership is the #1 Corvette dealer in the state of WI, so we have a large Corvette inventory, as well as plenty of Camaros. I also anticipate that we will have an allotment of SS Performances when they are released later in 2013. We currently have 13 Corvettes in stock (1 - Base Coupe, 1 - Base Convertible, 6 - Grand Sport Coupes, 3 - Grand Sport Convertibles, and 2 - 427 Convertibles), and 12 Camaros in stock (1 - LS, 2 - LT Coupes, 4 - SS Coupes, 3 - SS Convertibles, and 2 - ZL1 Coupes). If anyone is looking for a new or used performance car, please drop me a PM, or call me at (608)824-1343, or email me at [email protected], and I will be happy to help you. We do not charge adjusted dealer markups on our cars, and oftentimes are selling them below MSRP. Joe, I wish all the very best & thank you for all the work you have done for the G8 community. Cheers. 2009 G8 GT White - 1-7/8" ARH, Magnaflow Axle-Back w/j-pipes, Roto-Fab CAI, Livernois Cam, Pat G Tune, Trans Cooler, UDP, Fasterproms Ported TB/Manifold, HSRK, Spoon Trailing Arms/Toe Rods, SJM Line Lock, BMR Bushings, 90mm MAF housing w/LS7 MAF. 19x8 Front 19x9.5 Back TSW Strips 255/275, TSS Atari Plaque/Front & Rear Arrowheads/ LOTB Side & Dash Emblems/Engine Plaque, GXP Diffuser, HID Headlights, LED Fogs & Side Markers, Red/Black Steering Wheel/Shifter/Armrest/Shift Boot, ACC Hood Panel. Congrats on the new job hope all is still going well. It gets better with every car that I sell. Ironically, the ones with the most HP are the most fun to sell, LOL! Congrats man! Good for you for doing something you enjoy. Im sure this goes w/o saying but keep us updated on what you hear regarding the new SS. Also, maybe you can get your newly found friend to trade in his SRT for something respectable. I'm still ragging on my buddy from work to go test drive a Camaro. He's serious, just busy with work. Work tends to wind down around the holidays, though. Apparently he's looking for a stripped down SS M6. 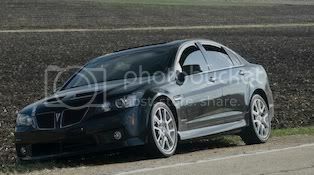 2009 PBM G8 GXP M6 #215 "ITS GRR8"
If we don't have what he's looking for, we can order or get it. We have a large stock of Camaros still, so we have Camaros to trade for Camaros, which means getting one is easier. They just announced that we have extended our Black Friday sale! That means sale prices and Gift Cards for all vehicles purchased today! $3,000 Visa Gift Card for Corvettes, $1,500 Visa Gift Card for Camaros. At least $250 for every other car on the lot. Vehicles must be purchased from inventory. I'm not changing the building that I work at, but the company that I work for is changing. Effective Thursday morning October 9, 2014, it looks like I am working for Bergstrom Chevrolet Middleton. It sounds like most of the staff will remain the same, but we will now have access to alot more cars from alot of dealerships within the Bergstrom family of dealerships around the state of Wisconsin. With change can come opportunity! Just saw this post - good for you for following your passion! Echo the thanks for all you have done for the G8, and especially the GXP, community!